Tube 12V spot light with surface mounted LEDs totalling 1.3W (equivalent effect to an 8W halogen bulb) for use in motorhomes, vans, campervans, caravans, boats etc. 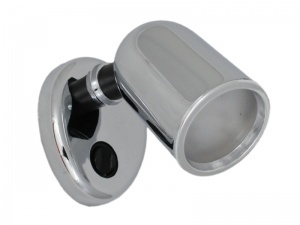 Plastic body with a chrome-plated finish and featuring a 51mm diameter tilt and swivel head (approx. 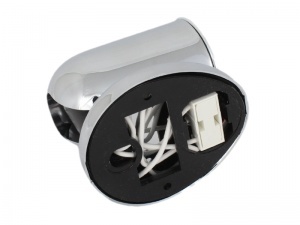 300° swivel and 90º tilt) with a black on/off switch. The lens is frosted to provide a softer lighting effect. The cover plate un-clips from the mounting bracket to access the two 4mm dia. fixing holes and connection is via 2 x 120mm flying leads. Bought this for my yacht - thought it would have been chromed metal but it is chrome effect plastic and badly molded at that. I would have paid more for a better quality item. We're sorry you felt the item was not good quality Peter. Please contact us if you would like to return it for a refund or replacement.